I’ve needed to sit myself down and give myself a good talking to this evening. I’ve been feeling frustrated because I’m trying to take care of so many things, and getting one item on the unending list done, is completely dependent on other things on the list, but everything is so up in the air about everything else, so I lie awake all night trying to organize my thoughts and come up with a plan, realizing it’s pointless, but I do it anyway only to find that last nights plan won’t work. I’m sure everyone reading this can relate because we’ve all felt it. I will force myself to remain focused on what’s most important. It rained all night last night and some through the day, and it’s raining right now again. The temperature didn’t go over 48, which is freaking cold. Kjira slept in clothing that she could have worn to the ski hill and would have been warm enough. I feel like my body is in shock! I baked 6 loaves of bread and that helped a bit to warm me up. Since it’s cold outside the creatures sat inside and played all sorts of games together. I love these kids so much. 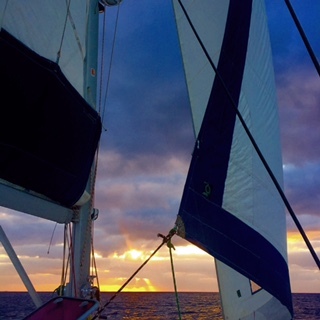 While we have been freezing here, Danny and Jude are loving life still anchored at a beautiful island in the Caribbean. They keep saying the wind is insane and making it impossible to leave, but their photos look calm and peaceful. I think they may have decided to just enjoy the peace and quiet and will from here on out just be known as our absentee family members who live on a sailboat someplace. Today aside from beach time and afternoon naps, they went with a group looking for migrating crabs. They saw a couple hundred. Kjira ran into a gas station wearing her hat that says ‘I’m really a mermaid,’ and as I was pumping gas, a young man drove his car close to me and motioned toward where Kjira was, and said, ‘your friend is really cute.’ While in the store, Kjira was asked where her tail was. She told the guy she left it in Hawaii, and when he asked her why, she said, ‘well, do you see an ocean around this place?’ They guy was amazed that she really was from Hawaii and asked if he could see her Hawaii ID. He ooh’d and aah’d for a while. She’s quite the celebrity in these here parts! I thought I found my first grey hair tonight, only to have Mycah inform me that it was just the way the light was hitting it. I am so disappointed. I will lay my body down now, and think of a plan for this week, for driving the rental car back to CA, picking up the truck and driving back here to Idaho, as well as picking up the new BMW key and driving it to Pocatello to show it to a gentleman who’s interested in it… all while listening to the falling rain and thinking of my absentee family in the Caribbean.